WP Cookie User Info Pro– is the utility plugin for you to display cookies notification to user faster and simpler and beautifully with minimal setting and configuration possible. This Plugin allows you to display and inform user about cookie used on your site in style for the site visitors. And with many other multiple customization option to change to fit the layout of the site along with highly mobile friendly responsive and sleek designs. A standout among-st the most powerful cookie info display platform with 3 pre-available layout and 30 templates to show cookie info in an most attractive and easy way. 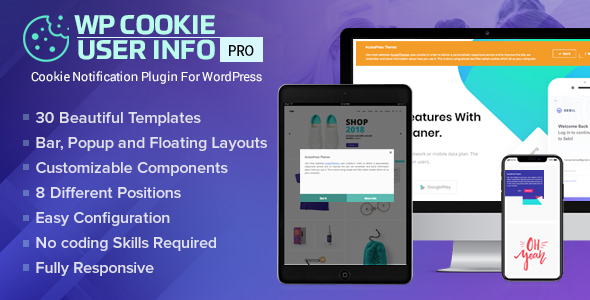 WP Cookie User Info Pro is a premium WordPress cookie display plugin packaged with 30 Beautifully pre-designed templates enriched with powerful components and functionalities. – 3 different beautiful and sleek template design to choose from. – You can build custom template with custom design options to customize the selected layout and template according to your need and requirement for the site. Then you can just assign them to design whichever cookie notice you require. -You can choose among 8 different layout positions. -Supports Import/ Export of all necessary settings into JSON code and File. -Quickly import/export using autogenerated JSON Code or download as JSON File.